There are many reasons why Southwest Florida is nicknamed, "Paradise!" From the swaying palms to the calm waters of the Gulf of Mexico, from the weather that virtually never sees a frost to the constant sea breeze, from the white sand of Fort Myers Beach or Lovers Key to the shell capital of the world, Sanibel, Southwest Florida is a great place to get married. Our staff of professionals have conducted weddings at many locations be it a local home or restaurant, or be it at the brink of sunset on the shores of the Gulf. 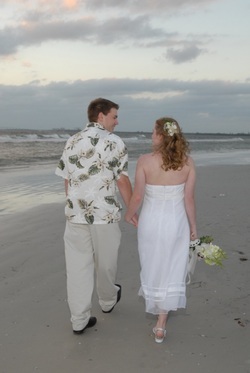 We would be happy to assist you in obtaining your Christian wedding at someplace special. While a church is often the place that we associate with God, the are locations all over Southwest Florida where the beauty of God can be seen and make a wonderful sanctuary. Simply contact our office and we would be happy to assist you in making your special "Paradise" wedding become a reality. Just call 239-481-3233 or e-mail us at mail@clpc.us. Since you are getting married at a location other than the church, there are no costs for the wedding coordinator, organist, etc. The fees below include a minimum of 4 hours of premarital counseling, officiating at the wedding, completion of all legal documents following the wedding, and travel, up to 10 miles from Cypress Lake Presbyterian Church. Getting married further out? No problem, we just need to adjust the fees to account for the mileage (hey, even the pastors have to buy gasoline!!!). Members: No Charge, although the wedding party is expected to cover all of hosts for travel and expenses, including mileage.